Discussion in 'RGB Lights - Intelligent Pixels and 3-Channel RGB' started by mmkooiman67, May 5, 2012. Just a quick question. I am looking for some recommendations for a DMX splitter. This is the first year that I am changing over to RGB so I have already broke the bank. Some inexpensive options would be nice. I have used the Lynx DMX Splitter very seccessfully the past few seasons. Pretty cheap overall to build. If you are going the RGB route, you may want to look into our MultiPort Blender. Complete DMX splitter and it has 12 volts built into the pigtails, which don't need to be used. To the OP, where are you located? That may help narrow down some options for you. Why do you see a requirement for a DMX Splitter? The answer to this question could be useful in providing good recommendations. You mention RGB but not the controllers etc planned to hang off the DMX cable. It is actually quite unusually to reach a device limit in this hobby with the use of 16ch+ controllers. If you are however using a lot of those cheap little 3ch chinese controllers then a splitter or repeater becomes a requirement. If you have a lot of the 3ch type units then a good quality splitter preferably with optical isolation would be a good idea, this will reduce the likelyhood of unintentional ground loops from multiple different power supplies on the DMX common wire. David, I am located in California. Phil, I am using a whole bunch of the cheap 3-channel controllers. The reason I am looking into a splitter is the signal is coming from the middle of my display and my display is about 150 feet wide. I know I can daisy chain, and I will be using the cheap splitters that DMOORE suggested, but I was just trying to make life a little easier and also will be over the 32 device limit. The DMX protocol, set by USITT, clearly states that you can not just split the data line for DMX. The signal must be repeated or multiplied in some manner. The reason being is without the multiplication of the data line there can, and will, be signal degredation and loss. I have had countless customers come to me and ask for solutions to what David is prescribing and my answer is always the same...You can not slipt the data line. With that being said, although I absolutely hate what those 3 channel controllers represent, I do recommend to people that you use our blending systems to send the power and the DMX data to those controller. It will power and control them and it stays within the protocol set by USITT. Anything else is not considered DMX but rather a different, non-DMX protocol. To chime in my two cents. Disclaimer: I use and sell products for pDMX. pDMX is NOT USITT Compliant. Power Over DMX was never in the DMX wiring spec. Splitting the data as David suggested can work but will place additional load on your drivers. If your drivers stop working, if you have data issues, or your stuff just otherwise doesn't work, then you need to reconsider going the proper route. As AP said, I would think about why you need a DMX splitter. With some careful cable considerations it's almost always easier to just run yet another cable instead of spending the money on a splitter. Not trying to start a war, but if wer're going to say we're following standards, lets be truthful here. There's been a lot of discussion about that lately, and with everybody's knowledge and help issues can be cleared up much more easily. Also very true and great point. Standards! well if people are going to open the door then please get it absolutely correct. Greg, we may rarely agree but in this case i agree that the use of y-splitters is a bad idea even if it works, your discussion on this would have come across better if it didn't read as a marketing exercise. David (Dmoore) if your happy to support your customers when they use those splitters as you have had them work then i'm not going to say don't post it as an option but it should come with the caveat that it is not the way EIA-485 Physical Layer should be cabled. Take note of the word "linear" in the above quote, the physical media standard does not allow "star" cabling configurations. DMX512 is a standard for digital communication networks that are commonly used to control stage lighting and effects. It was originally intended as a standardized method for controlling light dimmers, which, prior to DMX512, had employed various incompatible proprietary protocols. However, it soon became the primary method for linking not only controllers and dimmers, but also more advanced fixtures and special effects devices such as fog machines and moving lights, and has also expanded to uses in non-theatrical interior and architectural lighting; DMX512 has been used at scales ranging from strings of Christmas lights to electronic billboards. DMX512 employs EIA-485 differential signaling at its physical layer, in conjunction with a variable-size, packet based communication protocol. It is unidirectional. In 1998 the Entertainment Services and Technology Association (ESTA) began a revision process to develop the standard as an ANSI standard. The resulting revised standard, known officially as "Entertainment Technology—USITT DMX512-A—Asynchronous Serial Digital Data Transmission Standard for Controlling Lighting Equipment and Accessories", was approved by the American National Standards Institute (ANSI) in November 2004. It was revised again in 2008, and is the current standard known as "E1.11 - 2008, USITT DMX512-A", or just "DMX512-A". As of January 2011 ESTA, the Entertainment Services and Technology Association in North America, has merged with PLASA a similar organization in the UK. The new organization is called Plasa. All ESTA standards are now maintained by Plasa. POE or more specifically Passive POE. Numerous devices exist which make use of positive power received on pins 4 and 5 of the Ethernet cable, with negative return on pins 7 and 8. Power over Ethernet injectors exist which convert 110-240 V 50/60 Hz AC power to 9 V, 15 V, 24 V, 48 V or 55 V DC with currents ranging from 0.5 A to 2.0 A. In the common "passive" PoE system the injector does not communicate with the powered device to negotiate its wattage requirements, but merely supplies power. Now interestingly Passive POE and P-DMX are the same thing from a POWER perspective, both utilise 4-5, 7-8 and guess what that is actually compliant with the 802.3af Mode B standards for physically media. The term pDMX may be a poor choice when these sorts of discussions occur. E1.11 does not explicitly deny the use of Passive POE but does make reference to the use of 4-5, 7-8 as P-POE wiring when using 8 wire twisted pair cable. What however E1.11 does say is that the use of Cat5 type cable is limited to "fixed" installation. NONE of that matters though at the protocol level, if the sender and receiver are sending communications that have the DMX Frame structure then they are using the "DMX" protocol. What matters is that unless the device actually meets ALL of the standard it cannot be labeled as DMX512 or DMX512A. E1.11 also does discuss exceptions to the EI-485 standard for physical media grounding. How does all this relate..... it probably doesn't much but the standards door was opened so I walked through it. At a practical level the use of Passive Y type splitter is not supported or recommended for use by professionals in the field but may actually work as Dmoore demonstrates. Only Active type splitters should be used when looking to implement a setup that is as trouble free as possible. 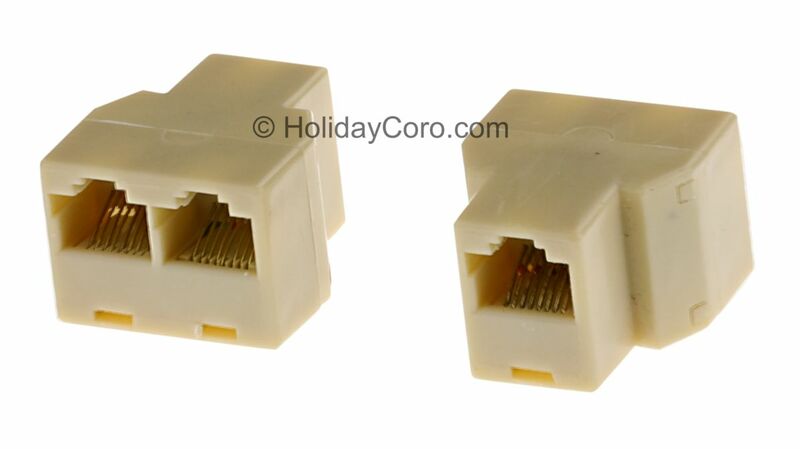 One additional note, David_AVD pointed out to me that one of the uses for those Dual RJ45 adapters is to provide a drop from the linear cabling to the physical controller where the controller only has a single connection point. This is valid under the standards only when the Stub length (the cable to the controller) is keep really short. Define really short? -> i've seen figures from a few inches to multiple feet so unless someone can point to a definate distance listed in a standard i'm going to say the rule of thumb is less than a foot. However: this document gives evidence that it can be much longer, note the measurements are specific to the particular RS485 IC's used. The generally accepted practice seems to be to ensure stubs are 150mm (6") max. That said, you will get away with more and yes it does depend a little on the cable and the types of DMX (RS485) chips used.